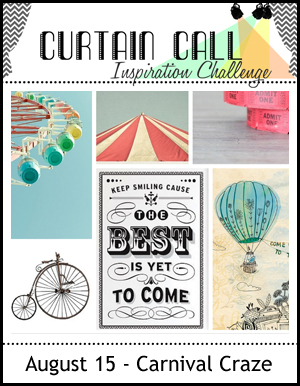 There is still time to play along with the Carnival Craze challenge at the Curtain Call. Remember the LEAD will receive any Lawn Fawn stamp st of their choice! Here to share another card I made with the Admit One stamp set. Are you looking for a little more inspiration? Check our the Curtain Call's Pinterest board HERE! I am also submitting this to the Simon Says Stamps Monday Challenge which the theme is carnival. This is darling Tracey. I love everything about it. Tracey, this is brilliant!! So colourful and so much fun! So fun. I loved that you used to colorful sun rays again Tracey. wow this is awesome.. love how you added the color.. very creative.. This is a fantabulous design, Tracey!! Love this! Awesome use of colors, Tracey! The two colored tickets and the colored sun rays look fantastic. Super fun, I love the triangles! Such a super fun card Tracey...love the colors! This is such great fun. I love the bursts of color on top of that merry go round, and the way you colored the tickets is perfect. Great composition of stamps, Tracey! This makes such a fun carnival scene! Lovely. Clean, simple and elegant. Gorgeous … I love the way the stamps go with the circus tent top… this is such a pretty and fun card. 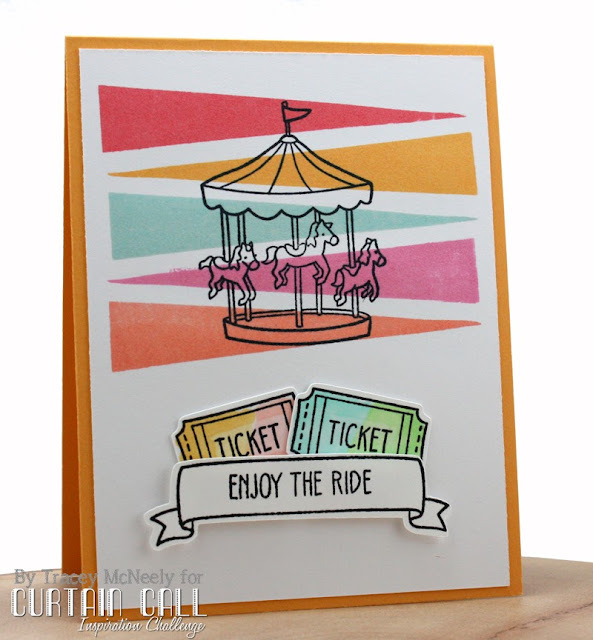 I love the carousel horses and the stripes of color and tickets make this so fun. I keep coming back to this... I think I'm smitten! This card is simply stunning! I love how you used color and black outlines to really make the images pop. Great artistic eye and I'm so glad you shared your talents with us here at the Simon Says Stamp Monday Challenge blog! Seriously LOVE your card! Such a creative twist with the colorful pendant/banners behind the carousel! Beautiful!! Love what you did with the long triangles.